Carnival barker: We didn't lie to you, folks! We told you that we had living... breathing... monstrosities! You laughed at them! Shuddered at them! And, yet, but for the accident of birth, you might be one as they are. They did not ask to be brought into the world, but! Into the world they came! Their code is a law unto themselves! Offend one and you offend them all! It's a simple enough film, this, and in some ways very much of its time for most of its brief length. It comes from a period where cinema had literally only just found its voice, and you can see that a bit in how former silent actors are still grappling with how to present themselves in talking film. 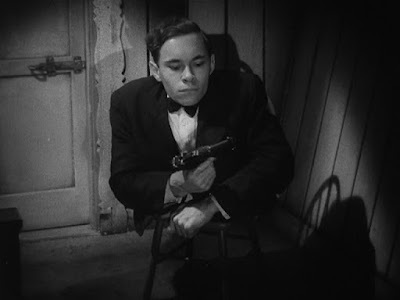 There are moments that look creaky and mannered now, the jolly, tinny parp of the jazz age film orchestra sometimes at odd with the images it soundtracks. The plot is straightforward enough. At a sideshow attraction, Hans, the sideshow's dwarf (Harry Earles), although engaged to fellow little person Frieda (Daisy Earles, Harry's real life sister), falls for trapeze artist Cleopatra (Olga Baclanova). Cleopatra is in fact sleeping with Hercules, the strongman (Henry Victor), but strings Hans along for her cruel amusement. This changes when Daisy lets slip that Hans is in fact the beneficiary of a huge inheritance. Cleopatra and Hercules hatch a plot: Cleopatra will agree to marry Hans, murder him and run off with both the money and Hercules. But the two villains are both stupid and incompetent; Cleopatra cannot hide her revulsion at the thought that she might be accepted by Hans’ peers as one of them, and her intentions are transparent from the beginning. The sideshow people, whose sense of family is absolutely inviolable, turn on her and her partner and exact their revenge. Around this very simple plot, though, we see the daily lives of the sideshow freaks between shows, their mundane happinesses, their camaraderie. 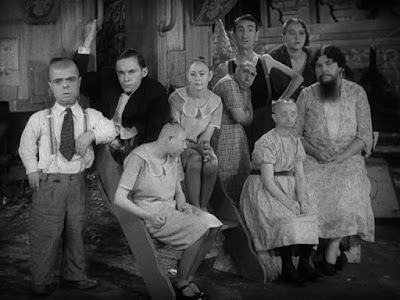 Nearly all of the “freaks” in the film were real-life sideshow performers, and they more or less play versions of themselves: Lady Olga the Bearded Lady, “Pinheads” (that is, people with microcephaly) Schlitzie and the Snow sisters, Josephine Joseph the Half Man-Half Woman, Koo Koo and Elizabeth Green the Bird Girls, Johnny Eck the Half Boy, Martha Morris and Frances O'Connor the Armless Girls, Peter Robinson the Living Skeleton, Prince Randian the Human Torso and conjoined twins Daisy and Violet Hilton. In fact, this sideshow repertoire was significantly bigger than any real show had ever been, and certainly no real sideshow would have extended as far as three “Pinheads” and four people missing limbs: you'd have got one of each, and there's a sense that Browning just wanted to include every sideshow performer he can find. But what this means from a purely historical standpoint is that with Freaks we have documentation in film, and in some places the only documentation, of some of the most successful sideshow and vaudeville performers of the day, being themselves, and of a subculture that for all intents and purposes no longer exists. It's useful here to point out that not all of these people had disabilities; Elizabeth Green was apparently just a bit funny looking and used her costume to accentuate that; there's a sword swallower (Delmo Fritz), a fire-eater, and Madame Tetrallini the fortune teller (Rose Dione). Others wouldn't be thought of as having disabilities now. A Bearded Lady is just an able-bodied woman with slightly more hair than average, for example. The most interesting from my own standpoint is Josephine Joseph: although accounts vary, it seems that she was, unlike many Half-Man-Half-Woman performers, born intersex, and wound up using her androgyny as a performer in that very literal and not uncommon style. And it's interesting to see someone being non-binary (because expressing both parts of a binary at once is about as non-binary as you can get), and visible, the better part of a century ago. And that's deeply ambivalent because on the one hand this person gets to be non-binary and visible, as I said, but the cost is that people gawp, and laugh, and mock. But on the other hand, they're paying for the privilege and she's getting a decent cut of the profits, and in the biographical sketches of many of these people, over and over, the subtext is often, they're going to gawp anyway so we might as well make coin from it. It gets a bit more complicated when you look at the people whose bodily deformities come with learning disabilities, people like Schlitzie and Koo Koo. Schlitzie apparently loved every second of being in sideshows, but he also apparently had the cognitive development of a young child, so there's that question of exploitation. Schlitzie was happy, and made a long lasting and comfortable living in an era where someone with his disability had literally no other avenue of gainful employment. Still, it's interesting to note that of the parade of history-busting story elements in Barnum hagiography The Greatest Showman (2017), the one that stuck out for me was that the developmentally disabled performers of Barnum's American Museum were entirely erased from the story, and for the simple reason that you can argue a Dog-Faced Boy and a Bearded Lady aren't being exploited if they're fully able to grasp what they're doing and you can make the story into one about body positivity without a worrying shadow. So no Zip the What-Is-It in your circus musical, thanks. These performers can't be pigeonholed. Johnny Ecks and Schlitzie, for example, had a blast making the film; on the other hand, the legendarily vocal Lady Olga (“the longest beard in showbiz”) thought the film was “An insult to all freaks”. All of these people agreed to be in the film, as far as I can tell, mainly because Tod Browning, who had run away to join a circus in his teens and who knew sideshow performers, convinced each of them personally that he wanted to make a film from their point of view – some of these people either were or became his friends, in fact. And each of these people gets to be, well, a person. They’re all given the same respect by the camera for most of the film that anyone else would. The film’s central thesis is the cameraderie of these people, the sense of family they have. And this is underlined that among their number are two able bodied people: Phroso the clown (Wallace Ford) and animal trainer Venus (Leila Hyams), both of whom accept and are accepted by the sideshow performers, the “freaks”, who neither judge nor are judged. 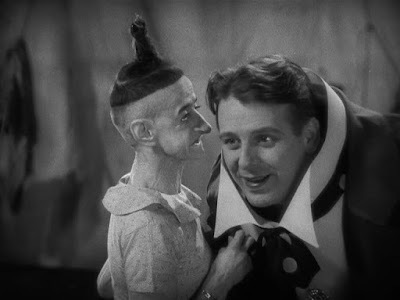 These lovers stand as a contrast to the film’s other pair of able-bodied lovers; in fact Phroso is pretty clearly a stand-in for Browning himself, who sees the humanity of the “freaks” and wants to present them to the world. Venus, meanwhile, begins the film breaking up with Hercules, who treated her pretty badly, and entering into a sweet relationship with Phroso, and while she begins in much the same place as Cleopatra, finding the sideshow performers off-putting, distasteful even, her arc ends with her standing in solidarity with them, even to the extent of being in mortal danger for their sake. 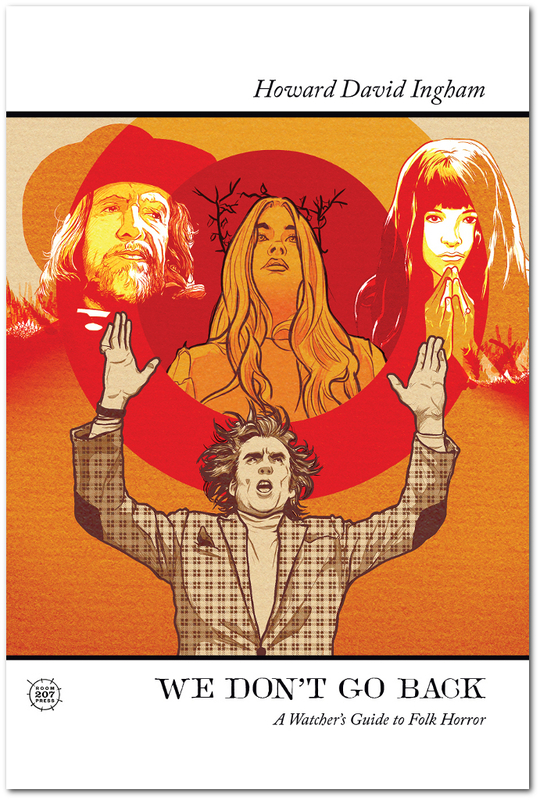 The most developed subplot concerns the Hilton Twins, who at the time this movie was made, had only just been emancipated from their tyrannical and exploitative guardians who had trained them as musicians and dancers, but also kept them as prisoners. Fresh from a $100k settlement (and in 1931 that wasn't chickenfeed) they stayed in the same business, but happiness seemed to have eluded them. In Freaks, Daisy and Violet (playing characters called Daisy and Violet) each find love, and each is engaged to be married, and we see the difficulties of navigating that when you are literally joined at the hip. Phroso pinches Daisy's arm; although Violet has her eyes shut, she can identify where her sister was touched. And we see a moment where Violet's fiancé kisses her, and Daisy feels the thrill. This seems to have been mentioned a lot in their biography, in the way that in their closeness, they shared emotional and physical sensation. Despite Browning's desire to celebrate his colleagues, Freaks was, however, always thought of as a horror film. But of the disgusted audiences back then who killed it dead, the censors who cut a third of its running time (and the British censors who banned it for over 30 years), none seemed to get the film's central thesis: who are the monsters here? Some American critics of course couldn’t see why anyone would sympathise with circus freaks; the British Board of Film Censors (now the British Board of Film Classification) on the other hand felt that the film was simply exploitative. Early in the film, several of the sideshow people are showing dancing and playing in the woods. A pair of able-bodied men, a landowner and his groundsman (Albert Conti and Michael Visaroff) see them and recoil in horror; Madame Tetrallini tells them that they are children, and the groundkeeper replies: they are monsters. But some of them are in fact children. 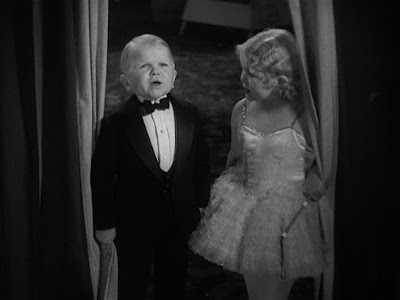 And the film wants you to see them as children. They're all people, and even the very basic message – these are people too! – turned out to be too much for US audiences. Browning loves these people. We see Prince Randian light a roll up; Schlitzie's new dress, and his glee at it; the way the Armless Girls navigate life with their feet; the Bearded Lady giving birth. Browning wants you to love these people, wants you to see their spark of humanity. And that includes the way that outsiders, including other circus performers, mock them. The horror is of course that the film’s monsters are able-bodied. While the “freaks” are kind and accepting, Cleopatra is disgusted by them, and unable to hide it, even though her stupid, transparent murder plot depends at least on her being able to lie. 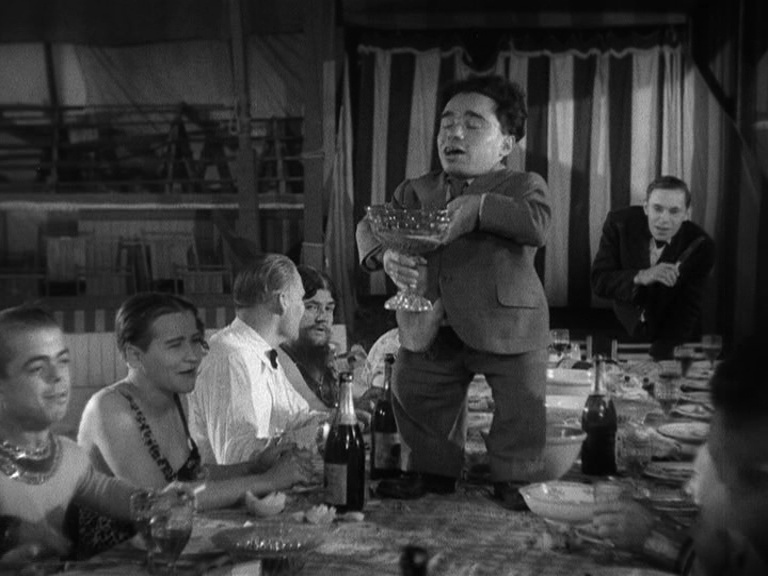 In the most celebrated sequence of the film, the “freaks” hold a party for Cleopatra and Hans’s wedding. They fill a loving cup from which they all drink, and they chant. We accept her, one of us! And it’s a joyful moment, where everyone is included, everyone is joining in. And Cleopatra, drunk, recoils in horror. Cleopatra: You… dirty! Slimy! Freaks! Freaks! Freaks! Freaks! Get out of here! Get out! She ends the party, screams at them, and dismisses them all, while Hercules laughs. She is the outsider here, but refuses their acceptance. She refuses to be part of their family. And they turn. We see the way that the sideshow performers watch Cleopatra and Hercules. A counterplot hatches. 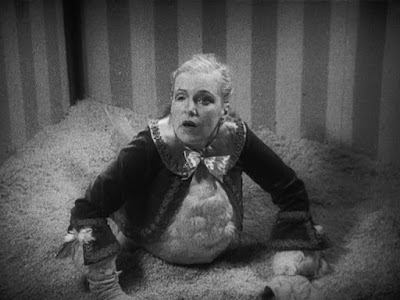 In the stunningly filmed climax, the “freaks” take their revenge, and this was the part that was too much for the British censors, who objected on the grounds that while all through the film we are encouraged to recognise the common humanity of the sideshow people, at the last, they're still portrayed as monsters. We are still supposed to be on their side, after all, and the dissonance involved in accepting both their humanity and approving of what they do at the end was simply the dissonance we get when good people do bad things for good reason. The film isn't framed any other way, and it's underlined by the way that Hercules comes to kill Venus, and Phroso and his fellow performers rescue her, even while they're coming for the murderous trapeze artist. And the film's most disturbing element is the fate of Cleopatra. We don’t see what they do to her, only the result, where she is the legless, deformed “chicken woman”, unable to do anything other than squawk, and unable to earn a living anywhere else. But this isn’t such a bad ending. If the full range of human expression is permitted to the sideshow people, why isn’t revenge part of that. We are often disturbed by the idea that a person with a disability might not be a saint, we often assume it, but why don’t people with disabilities get to be vengeful or violent? It’s just as prejudiced to assume that people with disabilities and deformities are always saints. They’re not monsters, but very few people are; the film has spent most of its hour-long running time underlining that. But it’s precisely because they are so decisively human that they have the right to be the sort of people who want revenge, and revenge taken entirely out of their solidarity with each other, a solidarity that is openly extended to anyone who will take it. The worst punishment they can inflict on Cleopatra is for her to become one of them – and she is now one of them, and no doubt is afforded the solidarity of acceptance among them because she’s not going to get it anywhere else – not because it’s the worst punishment they can imagine, or that being one of them is a sentence, but because it’s the worst thing that she can imagine, and "freak" is the worst insult she can bring herself to level. An original ending, now lost, would have shown an emasculated Hercules alongside her, and they would have performed a grotesque and comical duet, which suggests perhaps that her forced transformation is a reformation, a new life with the classic sting of the fable. She is humbled. She is brought to a low that is explicitly and uniquely her low, and from her actions. All of this is very human. Freaks is a compassionate film that shows people being people, and the thing about people being people is that sometimes people need to express their darker emotions. I don't know if it's exploitative. I don't know if it's an insult to the differently bodied. But it's a document of some of the most talented people of their era, and a story that allows people with disabilities the gamut of human feelings. People need to have that darkness to be whole. To suggest otherwise is to deny their humanity.